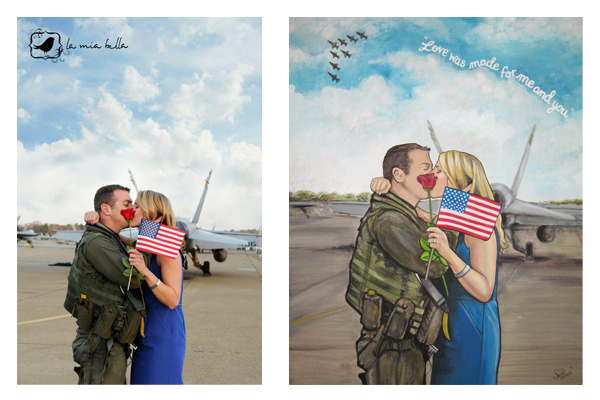 So, here it is…the much anticipated military love story of Laura and Eric Zilberman. A couple full of character, humor, loyalty, devotion, and LOVE! Laura and Eric are so much fun to be around and such an inspiration to anyone in a relationship, long distance or not. They’ve overcome many obstacles, often involving distance and the nature of their careers. They truly seem to have a connection that none of that could ever break. They enjoy the time that they do have together and look forward to more of it. We could learn a lot from the Zilbermans! Lauryn Martin, my business partner, and I were fortunate enough to spend some time with this awesome couple a few months ago, when we visited Virginia Beach for the Steel Pier Classic and Surf Art Expo. They opened up their home to us without hesitation and their hospitality was unforgettable! I thank you, Laura and Eric for being such sweet people and sharing your love story with us! For Laura’s birthday, Eric asked me to paint a portrait of the two of them from La Mia Bella’s (local photographer) photo and include a few extra sentimental details. What a thoughtful birthday gift! I have to admit, I listened to Glen Miller Pandora the whole time I painted this and it transported me into an old military romance film. Maybe I was just tired, but I gladly latched onto that inspiration and let it carry me through this painting! Sybil, This is a great painting . If you don’t mind I’d like to share this with my facebook friends as a tribute to Memorial Day this year. I have several military friends and family, many of whom never get the recognition for their sacrifices, involving their personal lives, the impact on their careers, and extended family. Whether it a infantryman, sailor or high ranking officer, we would not be America without their service. Thank you Laura and Eric Zilberman for sharing your love story.